One of my favorite things to do on the weekend is curl up with a good book, a cup of coffee, and a freshly baked pastry. Okay, to be fair, it’s usually multiple cups of coffee and more than one pastry, but I do stick with one book. It had been a while since I was able to indulge in this relaxing pastime, and I was experiencing serious cravings for a scone. Luckily, my weekend schedule was pretty light and the weather outside was overcast and rainy. It was the ideal time to commit to staying in and testing out a new scone recipe. I’ve only dabbled with making scones a few times in the past, and they sadly produced less than stellar results. This was is it though. I could feel it. Today was going to be the day I conquered the scone. To me, the perfect scone, is soft and slightly crumbly on the inside, yet firm and crisp on the outside. Extra points go to the ones that are dusted in crystallized sugar. And, of course, berries. ALL the berries. As I set off to make these scones (recipe via Pretty. Simple. Sweet), I was having a hard time picking just one type of berry to use. So naturally, I decided to use all of them. The mix I chose included blueberries, raspberries, and blackberries. You can find frozen mixed berries at your local grocery store or, if you prefer, you can opt to use a single type of berry. Pretty. Simple. 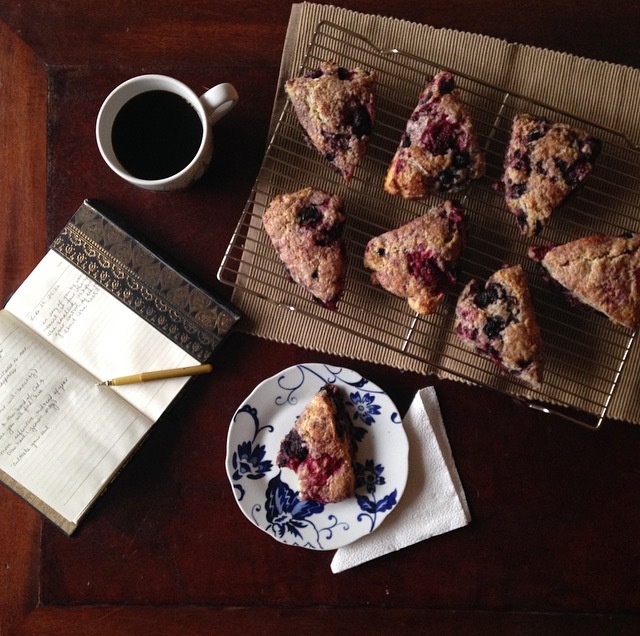 Sweet’s recipe delivers on exactly the kind of scone I was craving. The use of heavy cream in the dough produces a pastry that is rich yet balanced. The extra sugar on top adds sweetness which is cut by the zest of the lemon and the juice of the berries. This entry was posted in Pastries and tagged baking, berries, blackberry, blueberry, coffee, from scratch, homemade, raspberry, reading, scone, sugar, sweet, weekend by whiskandasmile. Bookmark the permalink. These look awesome! I have never made scones before but they’ve been on my list for a while. I might just have to try this recipe!